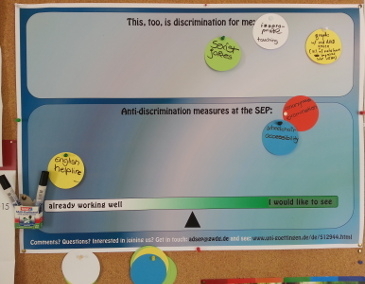 Why a Working Group Against Discrimination and Harassment? By communicating about relevant matters, such as workshops and lectures, we aim to raise awareness of discriminatory and offensive patterns of behaviour, thereby to establish a culture of respectful interaction within the Department. In addition, we will use this space as well as email and posters to inform students and staff about addresses for counselling and information both within the University and around Göttingen. Look for our first semiannual newsletter in the spring of 2018! In cases of discrimination or harassment, we can also serve as a first point of contact. We offer mediation and support in the search for counselling offices, such as the Faculty of Humanities Equal Opportunities Office, and can provide information about the form and nature of its consultation sessions. Since we are not a professional counselling service, however, we cannot ourselves offer in-depth counselling. We ask that you simply contact any of us directly. All communications are treated confidentially within the working group, and we will never use the information in ways you did not intend. If you would like your contact person to keep your identity hidden from the other members of the group, simply indicate this in your email.